Complete Set of 12 White Solid, Hard-Plastic Luminaries. 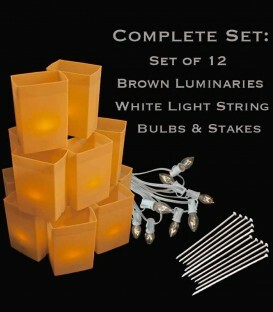 Includes choice of light string color, bulbs and stakes. 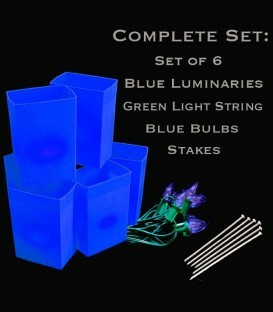 APPRECIATION SALE: 10% off today! 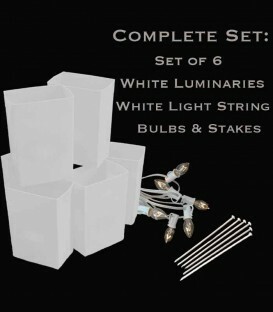 Complete Set of 6 White Solid, Hard-Plastic Luminaries. Includes choice of light string color, bulbs and stakes. APPRECIATION SALE: 10% off today! 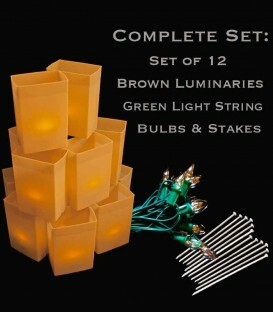 Set of 12 Brown Luminaries, Light String, Bulbs & Stakes APPRECIATION SALE: 10% off today! 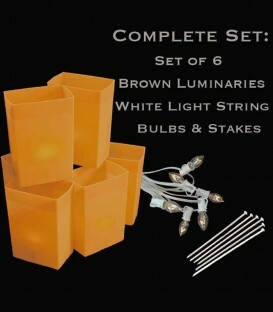 Set of 6 Brown Luminaries, Light String, Bulbs & Stakes APPRECIATION SALE: 10% off today! Complete Set of 12 Orange Solid, Hard-Plastic Luminaries. 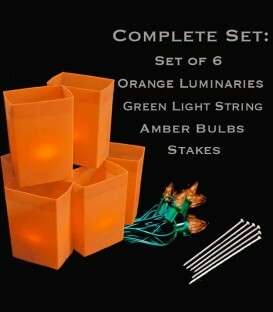 Includes choice of light string color, amber bulbs and stakes. 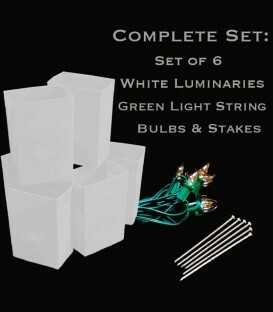 APPRECIATION SALE: 10% off today! 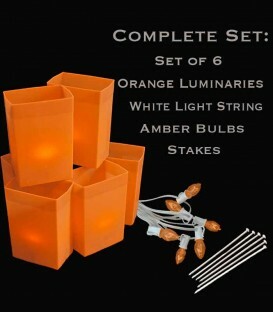 Complete Set of 6 Orange Solid, Hard-Plastic Luminaries. 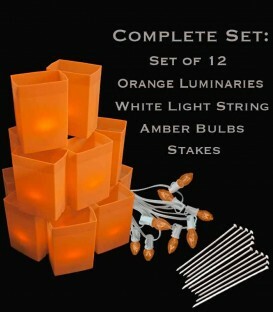 Includes choice of light string color, amber bulbs and stakes. APPRECIATION SALE: 10% off today! Complete Set of 12 Red Solid, Hard-Plastic Luminaries. Includes choice of light string color, red bulbs and stakes. APPRECIATION SALE: 10% off today! 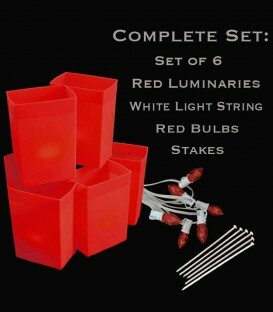 Complete Set of 6 Red Solid, Hard-Plastic Luminaries. 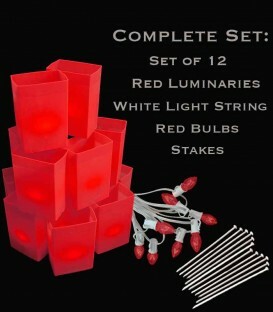 Includes choice of light string color, red bulbs and stakes. APPRECIATION SALE: 10% off today! Complete Set of 12 Green Solid, Hard-Plastic Luminaries. Includes choice of light string color, green bulbs and stakes. APPRECIATION SALE: 10% off today! 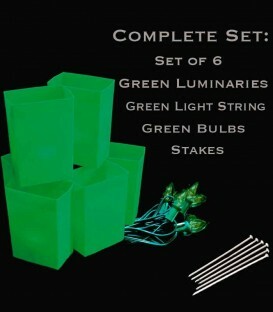 Set of 6 Green Luminaries, Light String, Green Bulbs, Stakes APPRECIATION SALE: 10% off today! 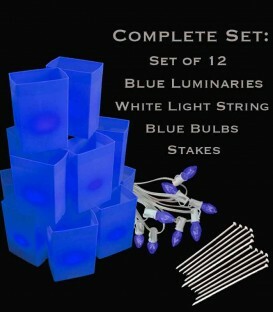 Set of 12 Blue Luminaries, Light String, Blue Bulbs, Stakes APPRECIATION SALE: 10% off today! 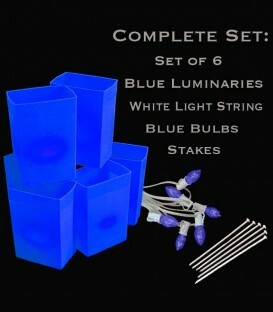 Complete Set of 6 Blue Solid, Hard-Plastic Luminaries. Includes choice of light string color, bulbs and stakes. APPRECIATION SALE: 10% off today! Complete Set of 12 Purple Solid, Hard-Plastic Luminaries. Includes choice of light string color, purple bulbs and stakes. APPRECIATION SALE: 10% off today! Complete Set of 6 Purple Solid, Hard-Plastic Luminaries. Includes choice of light string color, purple bulbs and stakes. 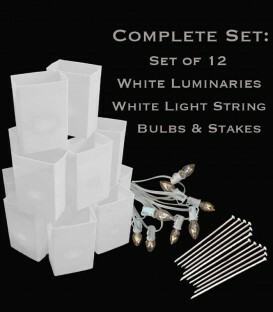 APPRECIATION SALE: 10% off today! 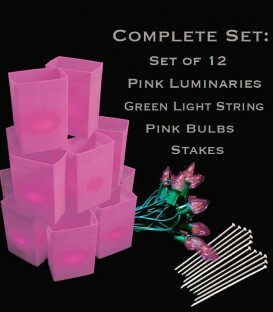 Complete Set of 12 Pink Solid, Hard-Plastic Luminaries. Includes choice of light string color, pink bulbs and stakes. 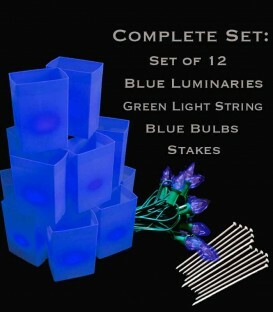 APPRECIATION SALE: 10% off today! 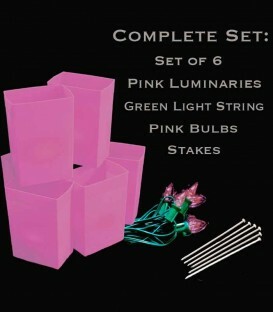 Complete Set of 6 Pink Solid, Hard-Plastic Luminaries. Includes choice of light string color, pink bulbs and stakes. APPRECIATION SALE: 10% off today!